Looking back at some of my files, I came across a picture and thought I would revisit a piece I had written in 2013 about Ethiopia and North Korea and the uncanny resemblance in the characteristics of the two regimes. Unwittingly, the West has created its own “North Korea” in the Horn of Africa, an imploding country teetering into the abyss. 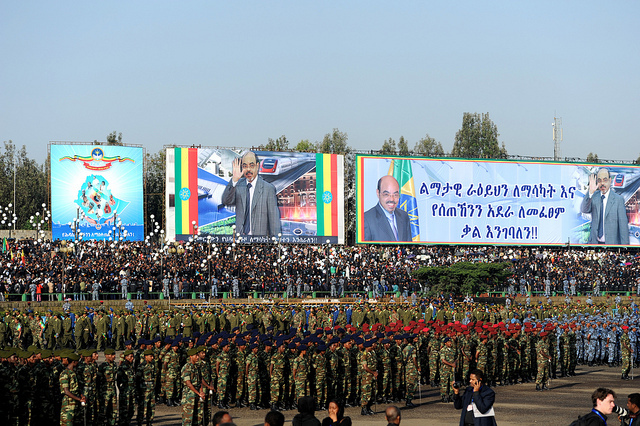 Despite the orchestrated defamation and vilification of leaders in the region by Ethiopia’s thugocracy, and its handlers, the people of Ethiopia and the people in the region have clearly identified the “North Korea of Africa”-and the facts are there to show the uncanny resemblance in leadership’s style and governance. But not only is Ethiopia getting arms from North Korea, with the acquiescence of the United States and its allies, but it is now an open secret that North Korea is developing Ethiopia’s munitions factories such as the ones in Ambo and Gafat near Debre Zeit. Like that of North Korea, Ethiopia’s government controlled media churned out programs complete with staged interviews to idolize the man. 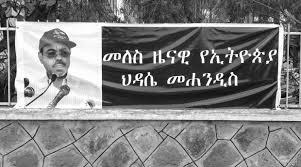 The most hated man in Ethiopia, the people were told, was the best thing that ever happened to them. Of course the gullible western media who have to justify their `silence as he committed genocides in Ethiopia’s Gambela, Ogaden and Oromia regions were only happy to tow the official line and join the chorus to tout him as being indispensable. 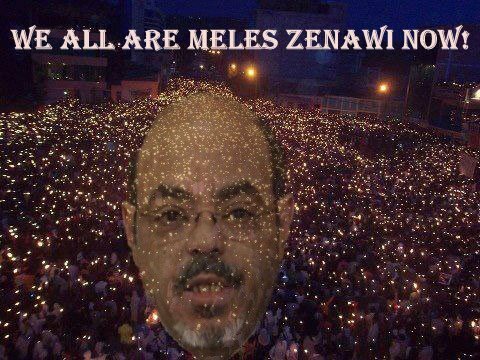 Meles Zenawi’s cult of personality became a prominent part of Ethiopian culture during his reign, culminating in the extended mourning that dragged on for months after his death. 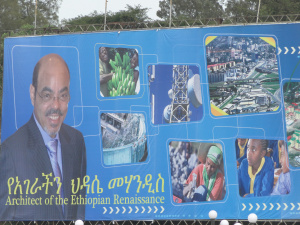 Touting him as the “Great leader” and “Chief architect of our country’s renaissance” who dared challenge the Abbay-“ ‘Abayen ye defere jegna”-when the new members of the parliament were sworn in, wearing the lapel pin with Meles Zenawi’s picture, in yet another eerie spectacle, they included him…his poster size picture, during the swearing in ceremony.